In our last article, we explained how you’re never too wealthy to budget. 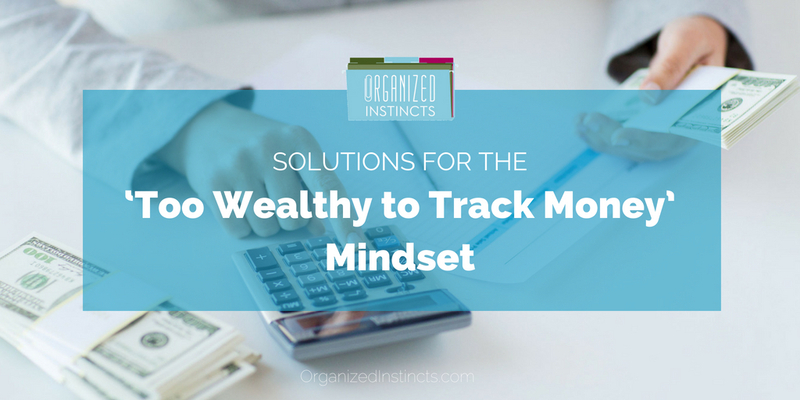 Today we’ll show you ways to transform a “too wealthy to track money” mindset into a workable solution for you and your finances. After all, we wouldn’t want you to tank your credit and/or make tax time a nightmare – both of which can cost you time, money, and well-being. So, you basically have 2 options to bypass the “too wealthy to track money” mindset. For the most part, your money is on autopilot. Maybe you’ve never had a money management system: you just paid bills as they showed up and left account management to the banks, CPA, financial advisor, creditors, etc. – relying on them to let you know if you missed a payment or alert you to potential fraud. Or maybe you had a solid money management system in place, but you no longer use it for whatever reason. A plan or system is key to successful daily money management especially if you’re doing it yourself. Streamline – Be proactive, not reactive. Including the below suggestions for mail and bills, declutter your daily money management with these 5 Ways to Streamline Finances. Chances are high, if you’ve stopped working the system it’s either because it isn’t a good fit for you, you simply don’t enjoy it, or the system is overly complex. While there are ways to transform a “too wealthy to track money” mindset, the easiest (and likely the best) solution would be to hire someone else to do this for you. So, you used to have the time and energy for daily money management — on top of all your other responsibilities like managing your household, career, social calendar, etc. But now, you’re simply too busy. And if you’re being honest: You just plain hate balancing your checkbook, following up to make sure that service or app you cancelled has in fact been cancelled, or reviewing account statements for accuracy. Eliminate tasks from your to-do list. Someone else will do the financial tasks you either don’t have time for or don’t enjoy doing. Decrease the financial clutter and, by extension, eliminate late payments and reduce the risks of identity theft. Relax, knowing exactly where your finances stand. No more guess work. No more last-minute chaos at tax time. Our clients are always pleasantly surprised at the simplicity of our process. And the relief they gain, knowing they’re in control of their finances, is priceless. Not to mention the freedom to enjoy the lifestyle they’ve worked so hard to obtain. Let us help you take control of your financial health.